Jason and Jim met in 2013 as guests on a radio show. Aligned by a shared passion for leadership, marketing, and the metalworking community, they had the idea to make radio waves of their own. Soon after, the MakingChips podcast was born. Each week, Jason and Jim interviewed prominent metalworking leaders who provided best practices to listeners on how to tackle the biggest challenges in manufacturing, all while sharing a laugh or two along the journey. 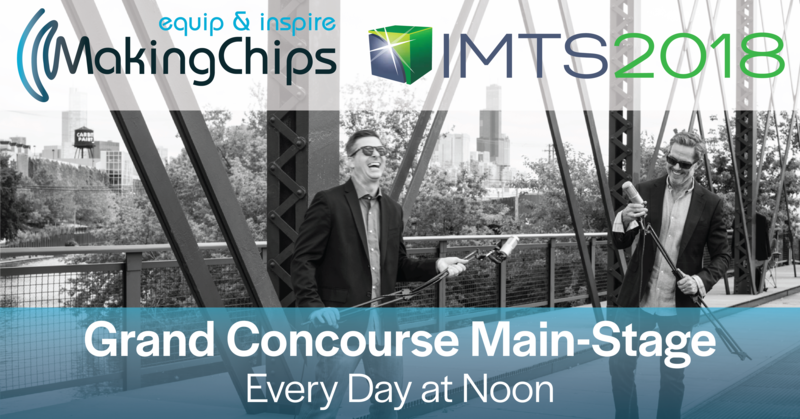 During IMTS 2018, Jason and Jim will be live on the mainstage of the grand concourse hosting daily panel discussions with their peers from Metalworking Nation and sharing their insights with the audience. Eighty-four percent of manufacturing executives agree – there’s a massive talent shortage in U.S. Manufacturing. If the skills gap is our biggest challenge, what are we doing as a community of manufacturing leaders to educate and onboard the next generation? Join us at noon on Monday, September 10, 2018 as we bring together a diverse panel of the best and brightest minds to brainstorm the different ways we can inspire our future colleagues and solve this massive challenge. Join us at noon on Friday, September 14, 2018 to learn how a machine tool manufacturer, a tooling manufacturer, and a CAD/CAM company join forces to elevate manufacturing businesses. Six days of IMTS is enough to make your head spin! Do you have the IMTS Hangover? We’ve got the remedy! We’ve spent an entire week exploring the future of manufacturing technology while connecting dreamers and doers. Saturday’s session brings the IMTS experience to a close as we rehash the most important takeaways from the week. Jason & Jim Wrap up the show with AMT leaders, Peter Eelman and Larry Turner at noon on Saturday, September 15, 2018.